Lionel Messi is known to others as having a very unusual way of playing. He is very imaginative when he plays on the pitch and he will take on a defender no matter what he's up against. Even though young Lionel is short, it doesn't stop him from playing, because as some may be big and strong, Messi is small and agile, allowing him to change his speed very quickly. Most people may also think that, as a little guy, he probably doesn't have the most powerful shot. Not true, because he not only has a hard shot, but he also has great accuracy, which is a good thing in a situation like a free kick or a corner kick. Messi is very outspoken, but at the same time cautious when he should be, because he is determined to play to the best of his abilities without letting up. 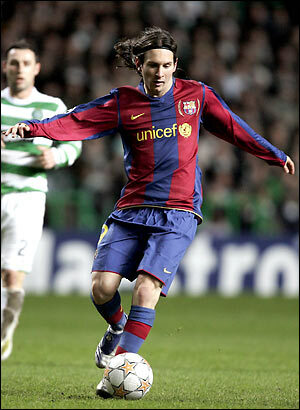 Lionel Andrés Messi started his compelling career in 1995 when he was only eight years old for the Newell's Old Boys. But by the time he turned 11, he was diagnosed with a growth hormone deficiency, which is a medical condition where the body does not allow enough growth and cell reproduction and therefore does not allow a person to grow as much as he could. Most people may have thought that this was going to stop him from playing soccer because he would be too small and other players would easily knock him off the ball. But of course they were wrong. Messi didn't care what other people said or did. As long as he was proving his talent and determination, that's all that mattered. This all paid off when he made his debut in La Liga in the 2004-05 season. This was when he broke the La Liga record for the youngest footballer to play a league game and the youngest to score a league goal. That was not the only unbelievable achievement little Messi achieved. Messi and his team also won La Liga in his debut year. But it didn't stop there, because the following year Messi and Barcelona won La Liga yet again and they captured the 2006 UEFA Champions League. But Messi was just getting started, because by the time he was 17 he was playing for the Argentinean youth team, where they won the 2005 FIFA World Youth Championships, and Messi was announced the top scorer. In 2006 he became the youngest Argentinean to play in the FIFA World Cup, and even though he and Argentina didn't win anything, he was still known to all. By the 2006-07 season he was already a first team starter for Barcelona, finishing the season with 14 goals in 26 league games. His first Senior International medal came in 2008 when Argentina won the gold medal in soccer at the Summer Olympics in Beijing. For the time being, Messi is still playing for FC Barcelona, and he is playing like he did when he first began professionally. I believe that Messi will become a legend of the game and that he will surpass some of the best soccer players' records, like Edson Arantes do Nascimento (also know as Pele) from Brazil, Diego Maradona from Argentina, Roberto Baggio from Italy, Franz Beckenbauer from Germany, Johan Cruyff from Holland, and many more. Lionel Andrés Messi is not only a superb soccer player, but a great role model as well to people who don't believe in the impossible. He went up against all odds by making it professionally and even though people may cut him down because of his size, they can't take away the fact that he is small but mighty. So to all the people who don't believe they can do it because of some wacky excuse like you're too small or too slow or too uncoordinated, all I can say is look at Messi. If he can do it, so can you! There are 3 types of people in this world; those who make things happen, those who watch things happen and those who wonder what happened. If I were you, I would try to become someone like Messi, a person who makes things happen, because it is an awful lot better when you're the one leading the pack.